If you’re a fan of arcade games, Playtech’s Space Invader pokie is a real money version which will have you reminiscing about the Pac Man days. Even Millennials will find enjoyment out of this title – all games found on our iPhone’s and Android devices follow the same gamer concept as the old-school titles, they’re just more portable. This title is based on the real arcade game from the 70’s where you must destroy the invading enemy space ships by firing at them. Players would earn points by shooting these ships, but Playtech allows you to earn real money on their version. 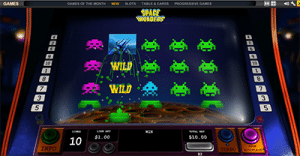 Space Invaders pokie is based on the original arcade game. Space Invaders looks and feels as if it isn’t made up of 5 reels and 10 paylines as the symbols are designed to feel as if you are playing the arcade version. Even the reels are slanted to feel as if you are playing an actual electronic machine with the bet adjuster buttons enlarged to appear as if you are sitting right in front of the game. The 10 paylines are fixed, but they pay both ways which is similar to playing 20 paylines. You will find a minimum of $1 and a maximum of $15 per line bet on the game – resulting in a minimum of $10 and a maximum of $150 per spin. This makes it quite a high minimum bet, so low rollers may have to miss out, or play just a few spins and see how you go. To get started, simply adjust your bet size and press ‘Spin’. Other buttons along the panel includes the ‘Turbo’ button which speeds the spins up and allows you to play more games in one sitting – great if you hate waiting for the reels to stop. There’s also the Autoplay button where you can select from 10 to 99 spins to play automatically. Adjust your preferred bet size before you start this feature. The format is quite standard with small quirks to tie in with the original, but unfortunately we can’t use our space bar to spin as we would in the arcade version to kill the monsters – this would’ve made for a very relatable function. The RTP for Playtech’s Space Invaders title is 96.16%. Click the info button to view the payouts. The symbols are quite like what you see on the original arcade game, just modernised. To see what each symbol pays, click on the ‘info’ button along the panel. 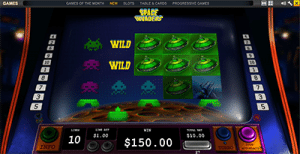 The low paying symbols are represented by the blue, green, and pink 8-bit alien space ships from the original game and at least three of a kind will see a coin payout. The middle paying symbols are represented by the more advanced blue and green ship symbols, and the high paying symbols are represented by the pink alien and orange planet. At least three of a kind of any of these symbols will score you a payout. There’s also the Wild symbol which is heavily involved in the features of the game, and performs the usual function of substituting for all symbols to create big wins. The bonus features activate randomly for big wins. The bonus features are loosely based on gameplay from the original arcade Space Invaders with the shooting cannons. The cannon will appear underneath the reels and after every spin it will move and stop under a certain reel. If it stops beneath reel 2 or 4 it will trigger the Invaders Turn Wild feature. This will see all the low paying symbols on the reel turning into Wilds to create big wins. If there’s a combination involving more than two Wild symbols the payout will be doubled. Next up is the UFO Feature which is triggered at random when a UFO hovers across the top of the reels and aligns with the cannon on the same reel. The feature awards a free Re-Spin where Wild symbols are distributed randomly across the reels. Once the Wilds have been placed on the reels, the Re-Spin will stop with any winning payouts awarded. Enjoy a blast from the past with the 8-bit artwork by Playtech. The graphics pay homepage to the original game, with the bright green cannon and pixelated 8-bit graphics. 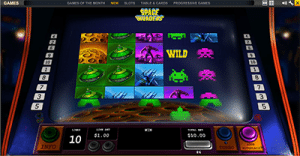 Players who never experienced this type of gaming may not find it as interesting as the graphics on NetEnt’s video pokies or BetSoft’s 3D titles, but those who do remember the simpler times of gaming will appreciate Playtech’s art on the reels. The audio mirrors an arcade hall and we are instantly transported back to the electro-mechanical era of these types of games as the sound blasts from our speakers. If you get a headache from the sound, mute it via the audio icon in the top right hand corner. The minimum bet of $10 is a bit steep and low rollers may miss out on this title – which is disappointing since it is based on a classic concept and classics often come with one cent wagers. The gameplay is incredibly simple however and the features are triggered quite regularly offering huge payouts. 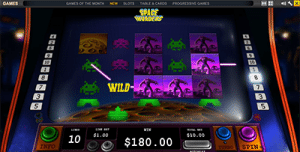 If you remember playing Space Invaders, or want a taste of what the game offered but with the chance to win real money, Playtech’s real money slot is a good option – that is if you can afford it.